The Designated Veteran Extension, as we explain our glossary entry on the subject, is a relatively new addition to the NBA’s Collective Bargaining Agreement. It allows players with 7-9 years of experience, who would normally qualify for a maximum starting salary of 30% of the cap, to qualify for a “super-max” contract that starts at 35% of the cap, a level normally reserved players with 10+ years of experience. A player who has seven or eight years of NBA service with one or two years left on his contract becomes eligible for a Designated Veteran Extension if he meets the required performance criteria and hasn’t been traded since his first four years in the league. A Designated Veteran contract can also be signed by a player who is technically a free agent if he has eight or nine years of service and meets the required criteria. The player was named to an All-NBA team in the most recent season, or in two of the last three seasons. The player was named the NBA MVP in any of the three most recent seasons. The player was named the NBA Defensive Player of the Year in the most recent season, or in two of the last three seasons. Davis can’t yet sign a Designated Veteran Extension, but his All-NBA appearances over the last two seasons have ensured that he’ll qualify, even if he somehow doesn’t earn another All-NBA nod in 2018/19. 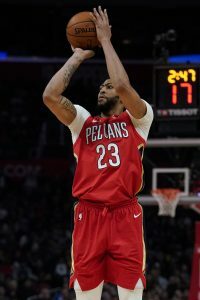 As of next July, the Pelicans will be able to offer Davis a contract extension that tacks an additional five years onto his $27.09MM salary for 2019/20. Based on the NBA’s latest cap projection for 2020/21 ($118MM), that five-year extension would be worth a staggering $239.54MM. Technically, any player who earns an All-NBA spot in 2018/19 and meets the contract criteria can qualify for a super-max, but the players listed above are probably the only legitimately viable candidates. And even in this group, guys like Beal and Drummond are a real stretch — if they were to improbably make an All-NBA team, their clubs still probably wouldn’t put Designated Veteran Extension offers on the table, since they’re not bona fide superstars. Thompson and Walker will both be unrestricted free agents in 2019, so if they meet the DVE criteria, they’d be eligible for five-year contracts with their respective teams worth up to a projected $221.27MM. Lillard and Green are still under contract for at least one more year beyond this season, but they’d qualify for super-max extensions if they meet the criteria — Lillard could get an extra four years, while Green could get five. A team can only give Designated Veteran Extensions to two players, so the Warriors wouldn’t be able to offer both Thompson and Green super-max contracts, since Stephen Curry already has one. On the plus side, Kevin Durant won’t figure into this equation for Golden State, since he has 10+ years of experience. A deal starting at 35% of the cap for Durant wouldn’t count toward the Dubs’ super-max limit. Finally, while Antetokounmpo can qualify for a super-max by earning All-NBA honors this season, he wouldn’t actually be able to sign such a deal until 2020, since he’ll only have six years of experience at the end of the 2018/19 campaign. Essentially, he’d be in the same spot that Anthony Davis is in now. Butler, Irving, and Leonard are probably more worthy of a super-max investment than most of the players in the above group, but they no longer qualify because they were traded while on their second contracts — Butler from the Bulls, Irving from the Cavaliers, and Leonard from the Spurs. They’ll need to reach 10 years of NBA experience before qualifying for a starting salary worth up to 35% of the cap. The Pistons have big plans for second-year guard Luke Kennard and he rates as a breakout candidate for the upcoming season, Ben Nadeau of Basketball Insiders writes. Kennard averaged 11.3 PPG, 3.5 RPG and 2.5 APG during the last 19 games of his rookie season and his role will expand under new coach Dwane Casey, Nadeau continues. Kennard has the ability to play three positions and he has the potential to become one of the league’s premier 3-point shooters, Nadeau adds. Power forward Henry Ellenson has been selected for the USA National Team qualifying for the World Championships, Rod Beard of the Detroit News tweets. Ellenson has played sparingly in his first two NBA seasons after being chosen in the first round of the 2016 draft but his role is expected to expand during the upcoming season under Casey. Point guard Ish Smith could be traded during the season, Ansar Khan of MLive.com opines. Smith is entering the final year of his contract and the Pistons also have Jose Calderon and Kennard available for that role, Khan continues. Otherwise, Smith will be the primary backup to Reggie Jackson. He improved his 3-point shooting toward the end of last season and is well-suited for the second unit due his energy, speed and ability to attack the basket, Khan adds. The big man combination of Blake Griffin and Andre Drummond should be enough for the Pistons to secure the final playoff spot in the Eastern Conference, Jorge Sierra of HoopsHype predicts. Sierra sees Detroit finishing third in the Central Division and eighth in the conference despite a lack of talent beyond the frontcourt duo. Channing Frye‘s impact on the locker room had a lot to do with the Cavaliers’ decision to bring back the veteran forward, according to Terry Pluto of the Cleveland Plain Dealer. GM Koby Altman wanted a respected veteran voice to guide the team through tough times with the departure of LeBron James, Pluto continues. Frye is very popular with his teammates and shares a close bond with the team’s remaining star, Kevin Love. Frye was traded to the Lakers last February by Cleveland solely to make the deal work financially and not because the front office had any issues with him, Pluto adds. Frye agreed to a one-year, veteran’s minimum deal. The team option on Jabari Parker‘s two-year contract gives the Bulls flexibility during free agency next summer, Kevin Anderson of NBC Sports Chicago notes. With a projected rise in the salary cap, the Bulls could free up enough cap space to sign a top-level free agent even if they decide to keep Parker. That could be accomplished by allowing Bobby Portis and Cameron Payne to become unrestricted free agents if they are not signed to extensions. If they decide to let Parker go next summer, they could have between $35MM-$53MM in cap space during free agency, Anderson adds. Cavaliers lottery pick Collin Sexton was a volume scorer during summer-league competition but reinforced the notion that his long-range game needs work, as Andre Snellings of ESPN details. Sexton did most of his damage inside the arc and needs to develop a consistent 3-point shot, Snellings continues. The University of Alabama product also displayed his ability to create for his teammates but he still can become a better passer, Snellings adds. The Pistons made arrangements to have Kevin Garnett work with two of their bigs, center Andre Drummond and power forward Henry Ellenson, Marc Stein of the New York Times tweets. GM Gar Forman’s promise two years ago to make the Bulls younger and more athletic is coming to fruition, Michael Walton of NBC Sports Chicago writes. By drafting Lauri Markkanen and Wendell Carter Jr. in the lottery, trading for Zach LaVine and Kris Dunn and signing Jabari Parker as a free agent, the average age of the projected lineup is 22, Walton points out. The team can now play at a quicker pace and cover more space defensively, Walton adds.